Infographics – not just beautiful! Now imagine trying to communicate even this information in any way other than visual…. To prepare students to be ‘successful learners, confident and creative individuals and active and informed citizens’ (Melbourne Declaration), they must be able to comprehend, interpret and extrapolate from information presented in a wide variety of formats. Increasingly, statistical data is being presented in creative and attractive infographics. Just as the old adage ‘a picture is worth one thousand words’, an infographic not only allows a great deal of data to be effectively communicated, it is also much easier for a viewer to make connections and draw conclusions from data that is presented in this visual format. Literally, an infographic is a graphic (picture) that displays information. An umbrella term for illustrations and charts that instruct people, which otherwise would be difficult or impossible with only text. Infographics are used worldwide in every discipline from road maps and street signs to the many technical drawings. 1. A visual explanation that helps you more easily understand, find or do something. 2. Visual, and when necessary, integrates words and pictures in a fluid, dynamic way. 3. Stand alone and completely self-explanatory. 4. Able to reveal information that was formerly hidden or submerged. 5. Designed to make possible faster, more consistent understanding. As Silvia Rosenthal Tolisano points out,Information, Knowledge, Visualization, and Communication are key themes that run through these descriptions – and are also key concepts for developing 21st Century Skills and Literacies. There are three key ways to use Infographics in the classroom. There are countless Infographics online and in newspapers, magazines and books. What better way to introduce complex data to encourage students to draw conclusions and see relationships than through an inspiring and beautiful infographic. Infographic a day for teachers– The always inventive David Warlick presents useful infographics for teachers. Check out David Warlick’s site also – he is an inspiring educator and you are guaranteed to learn something new every time you visit. Information is beautiful – David McCandless’ beautiful site, that accompanies his beautiful book. One of my favourite infographic creators. The fascinating thing about David’s work is that in many cases, he shares where he sourced his data – and the fact that it was all available freely online is an amazing testament to the amount of information we have access to today. Infographics use a variety of tools to effectively display information. Colour, graphics, icons, text, shape and other elements are combined in a creative way to visualise data. Each of these elements may (or may not) carry additional meaning, which visually literate viewers are aware of. Also, a pretty or professional infographic can be very persuasive – viewers must be critical of the data in the same way they would be if it were presented as a list of statistics. A list of numbers on a page may not always reflect a student’s understanding of the deeper meanings within data. Challenge them to create their own infographic, and you can be sure they will not only be familiar with the data by the time they are finished, they will also have examined it in ways only necessary to complete this type of process. Enjoy the wonderful, amazing world of infographics! If you have been working with your students in creating or decoding infographics, share with us! Post a comment below! 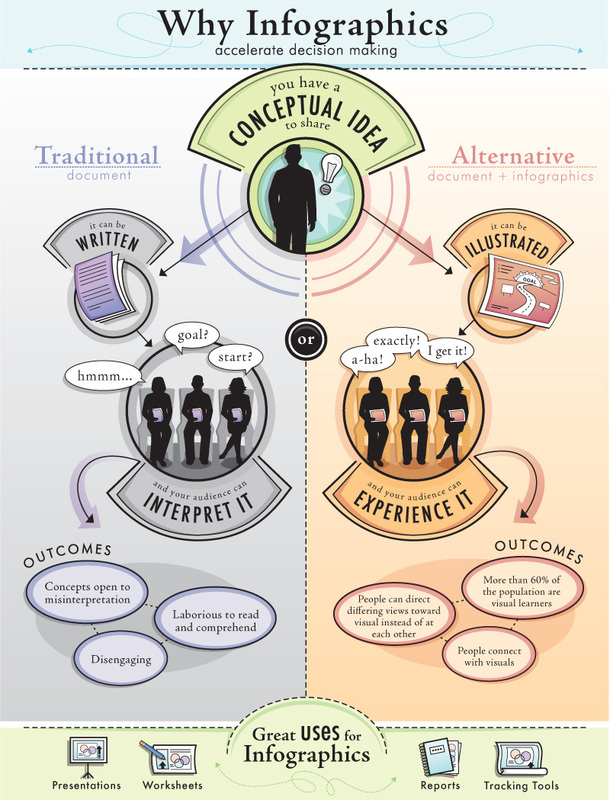 This entry was posted in 21st Century Literacies and Skills and tagged 21st century skills, critical literacy, infographics, visual literacy by ResourceLink Brisbane Catholic Education. Bookmark the permalink. Excellent post. I am keen to see student made infographics used as tasks and also students checking back on the facts in those that appear in newspapers and advertising. Thanks for this great resource list. Thank you MAT – getting students to create their own info graphics is certainly a great way to engage students in higher order thinking and critical literacy. Interesting, Informative, Insightful, Imaginative, Invaluable – Infographics. I have many of the same resources here and many more, if anyone is interested. Thank you Kathy! Your sites have always been a wealth of information and resources; it is great to have you stop by our blog!